Our Drop Deck and Haul Away Division is the backbone of the ANTS fleet. A specially designed trailer with portable loading ramps allows us to transform a drop deck into a Haul Away trailer. This enables us to provide those customers who ship wheeled vehicles as well as those customers who need a drop deck for height and/or oversized shipping requirements for freight. Our Flatbed Division provides the versatility and hauling power you’ll need for all your cargo. Whether its general freight, or the unusual, ANTS flatbed fleet is up to the task. 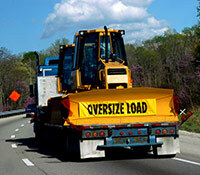 Our Heavy Haul Division has the experience and expertise to move those over-sized and over-weight loads. Whatever you need, we can deliver; double-drop extendible, detachable goosenecks, and multi-axle trailers, all are a part of our Heavy Haul fleet. From a 24' Straight Truck w/ lift gate to a standard 53', ANTS has the right equipment to meet your needs. Our tow away division delivers power-only transportation solutions for trailers, mobile units and intermodal equipment. From moving trailers to exotic cars to military equipment, ANTS tow away offers our customers quality, dependable service nationwide. We can handle all types of trailers with all types of configurations (5th wheel, pintle hook, ball, air or electric brakes, oversized and over-weight requirements) with an exceptional level of expertise. ANTS expertise will decide for you the most cost effective way to transport your cargo. Our 40% discounted rates on LTL will get your cargo where it needs to be while keeping your costs down. ANTS has a fleet dedicated to both short haul drayage within individual cities, in addition to longer drays between ports and customer facilities. We move intermodal equipment across town and across the country. ANTS has interchange agreements with every major railroad and the premier steamship lines allowing each of our customers the flexibility to maintain a competitive advantage. ANTS can only handle these shipments when related to international shipping. Import or export, ANTS can pack and load/unload your customer at their residence. Call or email for a price quotation.